Image: Erik McGregor/Pacific Press/LightRocket via Getty Images. The migrant crisis at the U.S. Southern border is even worse than we thought. According to a newly released investigative report from the inspector general of the Department of Homeland Security, the U.S. government detained and separated thousands more children from their families than officials had previously disclosed. Unknown. As in, the government has lost track of how many children we ripped from their families over a yearlong period. To make matters worse, the IG also found that the Trump administration did not stop family separations entirely after it claimed to halt its “zero-tolerance” immigration policy last June, and 118 kids were reportedly detained between July and December 2018. A phone call to your reps may not seem like much, but it can make a huge difference. Contact your national representatives and demand that they hold the administration accountable for its actions and identify every last child separated from their families. Similarly, contact your local and state officials and encourage them to protect or become sanctuary cities or states. What happens in your hometown can have a huge impact on the national political climate. When it comes to reuniting families, every dollar counts, whether you can spare $1 or $100. Organizations like the Refugee and Immigrant Center for Legal and Educational Services and the American Civil Liberties Union are still collecting funds to do life-changing work. 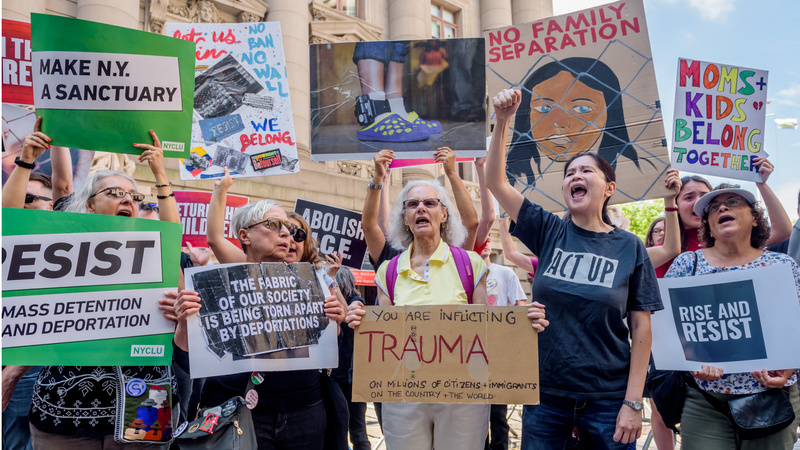 (Both of these organizations help provide legal representation to migrant families, while RAICES also helps supply bond payments to release detained parents. Other great organizations include the Texas Civil Rights Project, The Young Center for Immigrant Children’s Rights, Las Americas Immigrant Advocacy Center, the Asylum Seeker Advocacy Project, Border Angels and the American Immigration Council. Many migrant children need adult advocates to help them navigate court hearings and generally offer support. Groups like The Young Center for Immigrant Children’s Rights pairs adults with children across the country to help ensure these minors are as prepared as they can be as they fight for their basic human rights. Other groups, such as the Texas Civil Rights Project, often seek translators who can help bridge communication gaps between families and legal representatives. As always, lawyers willing to work pro-bono are also in high demand. If ongoing work isn’t feasible, families can also help by preparing meals for places like El Refugio, writing letters to or visiting detained parents or children and sending books and other supplies. It can be hard to stay on top of all the current events in today’s ever-changing news cycle. A significant way you can help families impacted by border separation is to remember that it’s happening and keeping conversations about it alive — no matter how many times the president tweets about “hamberders.” Talk to your friends, to your children, to your faith centers and more about these families and brainstorm ways to help. Who knows? Maybe these conversations will spark a community garage sale or inspire more people to call their representatives. Having conversations about scary topics with kids can be daunting for everyone. But often, these difficult talks can have the greatest impact. By teaching children how to be empathetic with others, you’re helping to ensure the future generation won’t make the same mistakes as the current one. Your little one may even surprise you with a few more ideas for how to help others.